To describe a new technique for repositioning a subluxated scleral-fixated rigid intraocular lens (IOL). 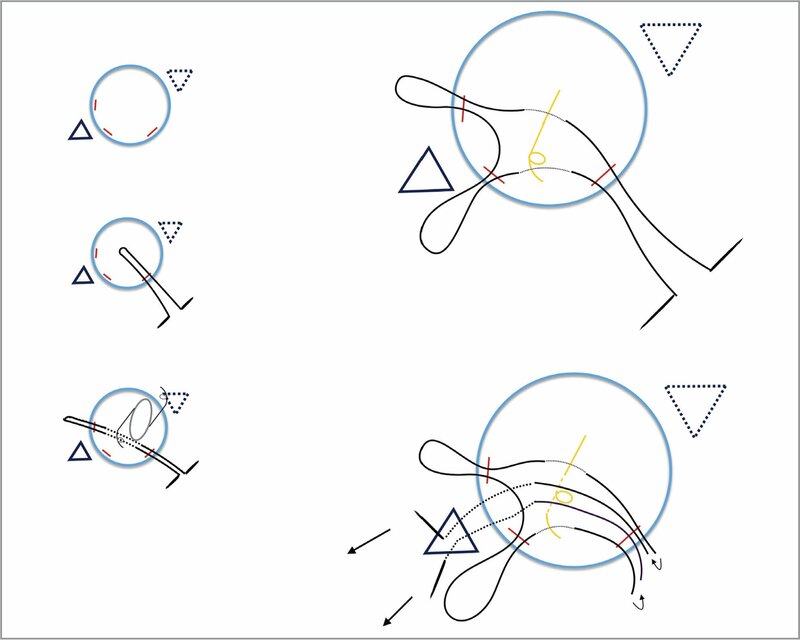 The authors present a modified intraocular threading technique to tie a cow-hitch knot around the eyelet on the dislocated haptic of a scleral-fixated rigid IOL. This technique uses three small corneal incisions to eliminate the need for IOL externalization and minimized the size and number of wounds. Three consecutive cases of subluxated haptics in two patients underwent this procedure. Postoperative IOL centration and alignment were satisfactory without tilt. No surgical-related complication was observed 1 year after surgery. A rigid IOL could be repositioned to a desired axis and centration via this modified cow-hitch technique, with better IOL support as compared with a single tie. Three small, clear cornea incisions are made with a microvitreoretinal (MVR) blade: two on either side of the scleral flap where the intended scleral suture will be placed (180° from the remained scleral suture), and the other incision at 120° apart from the flap for better intraocular instrument operation. A limbal-based triangular scleral flap is made 2 mm from the limbus with a No. 64 blade after peritomy at the axis of attempted IOL fixation (Figure 1, top left). Top left: Three corneal incisions and a scleral flap (solid triangle) were made. The dashed triangle marks the site of fixation of the un-luxated haptic. Middle left: A U-shaped polypropylene suture was introduced into anterior chamber via an isolated cornea wound by Y-hook. Bottom left: The loop was passed underneath the luxated haptic and out from an opposite cornea incision. Top right: The thread was pulled and externalized on the other corneal incision site to form a Y-shaped loop with the free-floating haptic hanging on the polypropylene suture. Bottom right: Needles are passed through the main corneal incision and over the haptic then exit through the ciliary sulcus underneath the scleral flap. A reverse Sinskey hook and / or intraocular forceps (such as Grieshaber asymmetrical forceps; Alcon, Fort Worth, TX) are introduced through the corneal incision to lift the subluxated haptic at the ciliary sulcus plane if the subluxated haptic is visible. If not, a pars plana approach under a vitrectomy lens should be used for grasping the haptic. For fixation, a double-ended, curved 10-0 polypropylene suture is introduced into the anterior chamber via the isolated cornea wound by a Y-hook (Figure 1, middle left). After passing the loop beneath the subluxated haptic, the loop is retrieved from the anterior chamber by the intraocular forceps or reverse Sinskey hook, which holds the haptic in position (Figure 1, bottom left). 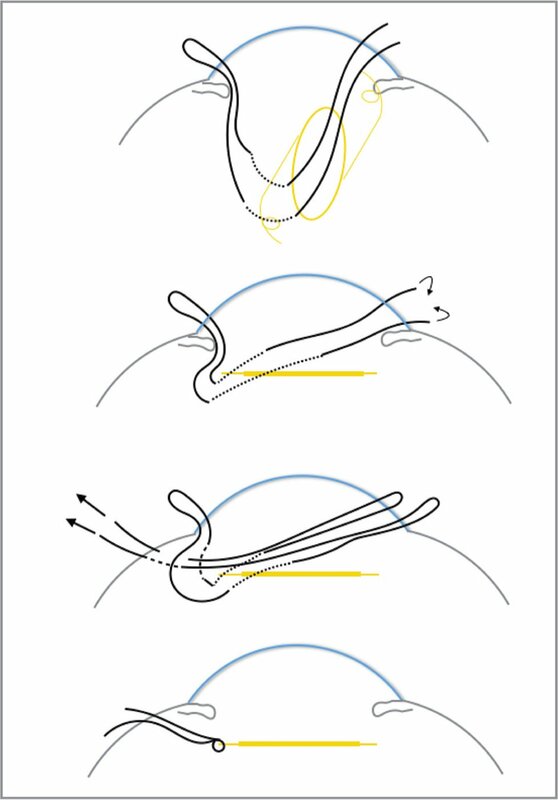 The thread lying between the haptic and the corneal incision is externalized from the other corneal wound next to the scleral flap, forming a Y-shaped loop with the free-floating haptic hanging on the suture (Figure 1, top right). An adequate length of the suture should remain outside of each incision to avoid slippage during manipulations. Next, a bent 27-gauge needle is introduced through the ciliary sulcus underneath the scleral flap and passed through the loop of suture while remaining above the haptic. The tip of the polypropylene needle is docked into the 27-gauge needle, and the suture is externalized from the ciliary sulcus aided by the 27-gauge needle. 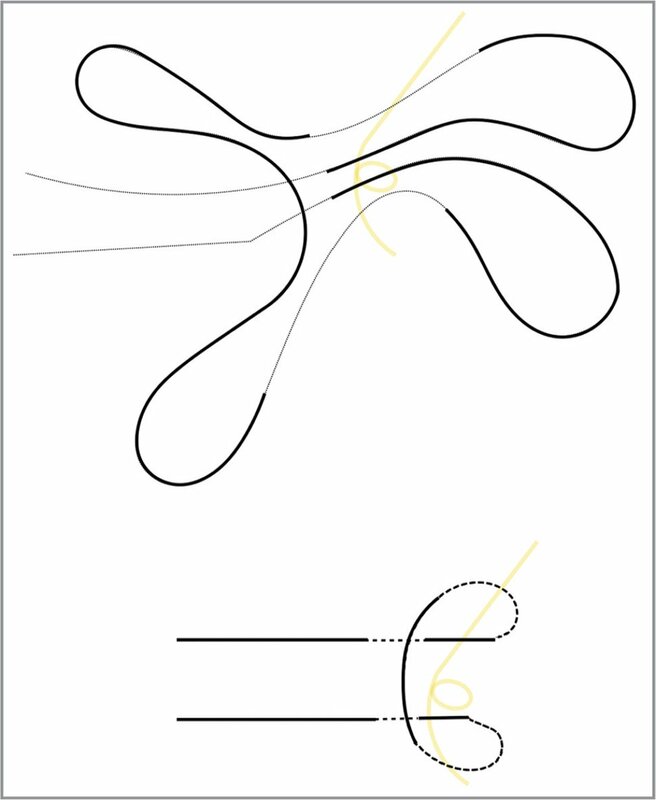 The procedure is repeated to externalize the other end of the suture (Figure 1, bottom right, and Figure 2). Once both suture ends are externalized from the ciliary sulcus, the threads are tightened to form a cow-hitch tie around the eyelet to secure the haptic (Figure 3). The suture knot was then covered with the scleral flap to avoid exposure. A cross-sectional view of the suturing technique. The threads, forming a U loop, first passed beneath the subluxated haptic and externalized through one corneal wound (Top). The two ends of the thread are then passed through the U loop at the level above the haptic and externalized from the ciliary sulcus (Middle images). The final position of the intraocular lens was adjusted to the sulcus place (Bottom). Close view of the threads forming a cow-hitch tie around the eyelet of the intraocular lens with our modified cow-hitch suture technique. Two patients who experienced subluxation of the scleral-fixated posterior-chamber IOL (PCIOL) due to single-knot dehiscence underwent this procedure. A total of two rigid IOLs and three haptics were relocated into the sulcus position via this modified intraocular cow-hitch suture method, avoiding the externalization of the rigid haptic or optic. A 56-year-old man presented to our outpatient clinic complaining about decreased visual quality. Scleral-fixated IOL subluxation with one suture dehiscence was noticed. According to the patient, he experienced an episode of PCIOL dislocation into the vitreous cavity at the age of 47. A poly(methyl methacrylate) (PMMA) single-piece PCIOL with eyelets on haptics (CZ70BD; Alcon, Fort Worth, TX) was used for scleral fixation along with vitrectomy at that time in another facility. He denied any traumatic event or special diathesis, and the lens in his fellow eye was well-centered and stable without cataract. Upon presentation, his visual acuity (VA) fluctuated between 20/60 and 20/25 at different clinic visits. His IOL was repositioned by the modified intraocular cow-hitch suture technique. Postoperative VA returned to 20/20, and the patient was satisfied with the improved visual quality. The IOL remained well-centered 1 year after surgery, and there was no refractive error on cylindrical axis. A 28-year-old woman with Marfan syndrome underwent pars plana lensectomy and vitrectomy due to lens subluxation about 10 years ago. A PMMA single-piece IOL (CZ70BD) was implanted with transscleral suture fixation at that time for aphakia correction. Ten years after, subluxation of her sutured IOL decreased her VA to 20/40, which prompted her to seek medical attention. This patient first received repositioning of one subluxated haptic with our new method and then underwent the same procedure on the other haptic, which dislocated several months later. Postoperatively, she regained best-corrected VA of 20/25. Refraction was -1.0 diopters in cylinder and the same as the fellow pseudophakic eye, which was centrally located without subluxation. Anterior segment optical coherence tomography images demonstrated good alignment of the lens without tilt. Good centration of the lens was also observed by slit-lamp exam and corneal topography. Many different methods are available for the management of subluxated scleral-fixated IOLs.6–12 IOL removal or exchange usually requires a larger wound, although the wound size would be significantly reduced in the case of foldable IOLs if IOL scissors were used to sacrifice the lenses; however, it is still more complicated when rigid IOLs are to be removed. IOL repositioning, in contrast, not only avoids a large wound, but also preserves the original IOL. Some repositioning techniques require the IOL to be partially externalized for suture knotting, which is also easier for foldable IOLs than rigid ones, since the mobilization and integrity of rigid IOLs remain a concern. Some other methods require multiple passages of instruments in and out of the globe13 or use an extra piece of eyelet from another rigid IOL.14 In our technique, the creation of small corneal wounds avoids the hassle of translocating IOL, and the instruments manipulate mainly the threads but not the IOL itself, preventing rigid IOLs from unexpected fractures.15 Additionally, the tie we performed is a cow-hitch suture, which minimizes slippage, especially since it is looped around the eyelet of the rigid lens, and prevents free suture ends from chaffing the iris. Our technique was also less technically demanding compared with directly intraocular re-threading through the eyelet. Although this method was developed for the PMMA lens type, it is also applicable to correct other types of subluxated IOLs. For rigid PMMA IOLs or foldable IOLs with closed-loop haptics (such as Akreos AO60; Bausch + Lomb Rochester, NY; or C-flex; Rayner, Hove, United Kingdom), this technique is best implemented and does not need modification. For subluxated, single-piece, foldable IOLs, despite all the existing repositioning techniques, our method could still be used with little modification, using another forceps to hold onto the end of the haptic to offer a counterforce while tightening the cow-hitch tie at the final step. Bloom SM, Wyszynski RE, Brucker AJ. Scleral fixation suture for dislocated posterior chamber intraocular lens. Ophthalmic Surg. 1990;21(12):851–854. From the Department of Ophthalmology, National Taiwan University Hospital, Taipei, Taiwan (IHM, CYT, CMY, TTL); Department of Ophthalmology, Fu Jen Catholic University Hospital, Fu Jen Catholic University, New Taipei City, Taiwan (CYT); School of Medicine, College of Medicine, Fu Jen Catholic University, New Taipei City, Taiwan (CYT); the Department of Ophthalmology, College of Medicine, National Taiwan University, Taipei, Taiwan (CMY); and Graduate Institute of Clinical Medicine, College of Medicine, National Taiwan University, Taipei, Taiwan (TTL). Presented as poster at the 2018 Mid-Year Scientific Meeting of the Ophthalmological Society of Taiwan. English editing was provided by the Department of Medical Research at National Taiwan University Hospital. Address correspondence to Tso-Ting Lai, MD, Department of Ophthalmology, National Taiwan University Hospital, 7, Chung-Shan South Road, Taipei, Taiwan; email: b91401005@ntu.edu.tw.